The U.S. is the third largest country in the world in terms of total area. It also has the third largest population of any country. That means that there are many, many places to choose to live. There are cheaper places and there are more expensive places. There are places with more to do, and there are places with much less to do. There are places with more people to meet, and there are places with very few people to meet. There are also many language schools to choose from. There are so many positive things to say about Atlanta, that actually, we won’t list them all here. At a later time, we will try to compile a list of all the reasons we can think of, but that would be a huge list with probably over a 100 reasons. 1. Housing is affordable and in demand. Atlanta boasts a very reasonable cost of living, particularly in comparison to some of the other cities on the Penske list. According to RentJungle.com, the average rent for an apartment in metro Atlanta is $1,003 per month, which is tied for lowest (with Phoenix) among the top 10 moving spots. If you have the chance to move to U.S. as a legal resident or, eventually, as a citizen, Atlanta takes the number one spot for top 10 U.S. cities for recent college graduates and young professionals, according to MarketWatch.com. Cash Bonus: The median salary for recent college grads is over $50,000 per year in Atlanta, CNBC reports. If you’re in the market for career opportunities, consider looking south. Atlanta is home to the third most Fortune 500 companies in America, and 16 of the 18 Fortune 500 company headquarters based in Georgia can be found in metro Atlanta, including Mercedes-Benz, Home Depot, UPS, Coca-Cola, Delta Airlines and Aflac. Atlanta may be the zombie capital of the world — popular AMC series The Walking Dead is filmed here — and home of the World of Coca-Cola, but the city has tons of other attractions. World’s largest aquarium. The 10 million-gallon Georgia Aquarium is the largest in the world – and is listed in Patricia’s Schultz’s bestselling book 1,000 Places to Visit Before You Die. Hot spots for foodies. The ATL is the fast food capital of America, and its food scene has something for everyone. Enjoy the unique Atlanta Food Truck Park and Market, farm-to-table eateries like Bacchanalia and critically acclaimed restaurants like One-Eared Stag. So many sports. Atlanta has no shortage of diehard sports fans. The area has six iconic professional sports teams, most notably the Atlanta Braves, Atlanta Hawks and Atlanta Falcons. The Braves and Falcons are now in in new, world class stadiums. Easy escape. The Hartsfield-Jackson International Airport is the second-busiest airport in the world and totes the most passengers (96 million per year!). The city enjoys four distinct seasons while avoiding the winter cold extremes we see in the Northeast and Midwest, offering the perfect amount of variety for those who are trying to escape the snow: Rainfall: 53.7 inches per year Snowfall: 0.3 inches per year Sunny days: 217 per year Average summer high: 89 degrees Average winter low: 34 degrees During the mid-summer months, expect humidity in the high 80s. “Atlanta is fast becoming one of the most diverse metropolitan areas in the southeast, challenging the inveterate black-white dichotomy that typically frames how people see the south,” Charles Gallagher and Karyn Lacy wrote in their essay, The Changing Face of Atlanta. Atlanta has large populations from around the world, especially large Korean, African, Latin American, Chinese, Indian, Japanese, Vietnamese, Brazilian, and other overseas countries. You can find every type of food in the world. 8. Atlanta has a fantastic MUSIC scene! Maybe you don’t think of Atlanta right away when thinking of hot music scenes in the U.S., but Atlanta is home to an expansive and impressive music scene — with many underground hip-hop and indie artists flocking to the city to get their start in the industry. This is due to Atlanta’s proximity to the ever-hip Athens, Ga. (where bands like of Montreal, Azure Ray, R.E.M., the Black Crows, and Louisiana’s Neutral Milk Hotel gained fame) and what used to be its vibin’ college radio scene. 9. CCB is in Atlanta… well, Duluth! Duluth is located just outside Atlanta and has been one of the fastest growing cities in the entire U.S. for the last few years. Why? For all the reasons we already said. Plus, Duluth has even cheaper rent and gas prices than inside the city of Atlanta. There are so many great things about Duluth, that living here is like the icing on the cake of Atlanta! America is a very big country with a large, diverse population. That means we have all kinds of sports. As you probably know, there are many expressions used in sports. Sometimes, these expressions start to be used in everyday life. 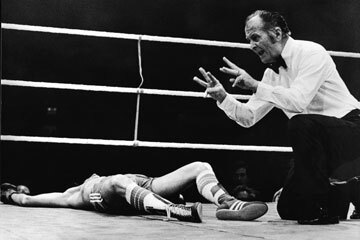 Today, we may say someone or a company is “down for the count” because of a setback or a small failure. But that doesn’t mean they are “out” yet. A fighter who is knocked down may still stand up and win the fight. Likewise, a businessman or company can lose some money or some deals but over a long time still be very successful. Are you interested in a full list of sports idioms you can use outside of sports? Or just search around online!